Tamika Catchings #24 of the Indiana Fever blocks a shot by Maya Moore #23 of the Minnesota Lynx during the third quarter in Game Five of the 2015 WNBA Finals on October 14, 2015 at Target Center in Minneapolis, Minnesota. 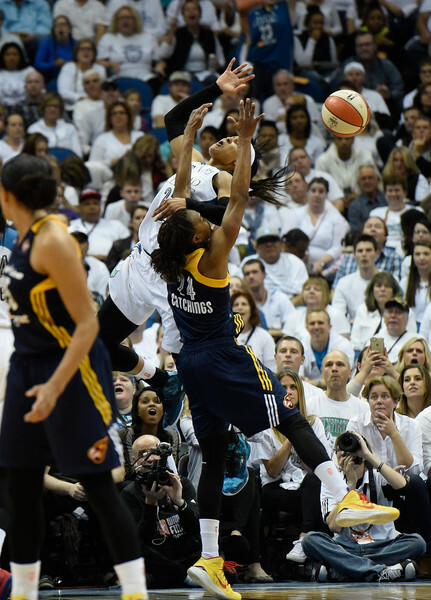 The Lynx defeated the Fever 69-52 to win the WNBA Championship. NOTE TO USER: User expressly acknowledges and agrees that, by downloading and or using this Photograph, user is consenting to the terms and conditions of the Getty Images License Agreement.